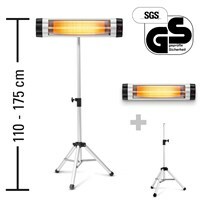 Package deal consisting of the radiant heater IR 2500 S and the matching IR telescopic tripod. Package deal consisting of the IR 2550 S infrared radiator and the matching IR telescopic tripod. The infrared heating panel TIH 300 S incl. feet with a heating capacity of 300 Watt. 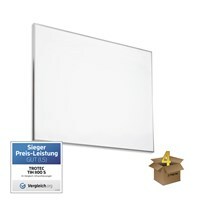 The infrared heating panel TIH 300 S with a heating capacity of 300 Watt, incl. mounting clamps. Package deal which includes the Infrared Heating panel TIH 300 S and a socket thermostat BN30. The infrared heating panel TIH 400 S incl. feet with a heating capacity of 450 Watt. The infrared heating panel TIH 400 S with a heating capacity of 450 Watt, incl. mounting clamps. Package deal which includes the Infrared Heating panel TIH 400 S and a socket thermostat BN30. Package deal consisting of Infrared Heating Panel TIH 300 S and a pro extension cable. Package deal consisting of Infrared Heating Panel TIH 400 S and a pro extension cable. Deal which includes Infrared Heating panel TIH 500 S and a socket thermostat. The infrared heating panel TIH 900 S incl. feet with a heating capacity of 900 Watt. The infrared heating panel TIH 900 S with a heating capacity of 900 Watt, incl. mounting clamps. Package deal which includes the Infrared Heating panel TIH 900 S and a socket thermostat BN30. Package deal consisting of Infrared Heating Panel TIH 900 S and a pro extension cable. The infrared heating panel TIH 1100 S with a maximum heat output of 1100 watts + mounting clamps. Package deal consisting of the infrared heating panel TIH 1100S and a pro extension cable. 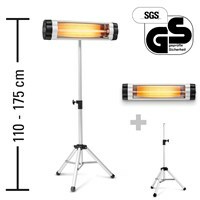 In our online shop you can find great packages of infrared heaters.